Sent an email to add my bimotas to the register today. I know, i know... i've got way too much time on my hands. But, it's been raining here for a week. 3 of the largest collections of Bimotas in Italy are housed in Milan, Muro Leccese and Lecce. I've been lucky enough to have seen all 3, and it's a very wonderful (bimota) experience. Could you shed some more light on these as I'll be in Italy next year and be good to see if I could include in the trip. Ebay DE now. SB6 frame number 00601 for sale. I guess that's one less driving about. Looing forward to sharing and caring via the forum. Welcome to the forum Og. are you trying to copy my collection? Now I see why it want easy finding my SB6. Oily and yourself must have 1/2 the UK population of them. Welcome on board Og... good man! Collection is complete, unless the mythical all Black (grey) Mark 3 ever appears for sale! These three all work fine, the two without mirrors are resting (mirrors off to avoid storage damage) the one with mirrors is happily driving about. Its a standard mk 2 on a 98 plate with uprated factory forks, Antera Wheels and Racing Exhaust, the closest I could find to the mythical mk3. Next summer I,ll be back on Red and White. 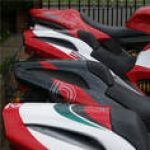 Do you have any info on the Crescent Bimota's? Likewise to the others comments, welcome on board, keep Oily company for one. Welcome to the forum Og. Nice line up there. The Crescent SB6 is a 94 plate. When i bought it the owner told me it was retuned to the supplying dealer in 94 a month or so after purchase to have the additional colours added. He said it was to match the display bike at the Milan bike show. Who knows but could be true. Apart from that the bike is pretty standard mk1 with km speedo, early clock arrangement and smaller headlights. It had carbon frame covers fitted when new by the supplying dealer. The frame cover circle completes! Some time ago, I tried and failed to get literature from the Milan bike show in 93 or 94. The answer could be there, if anyone can find the photos, brochures etc.